Suburbs of Rockford: Machesney Park, Machesney Pk, Morristown, New Milford. 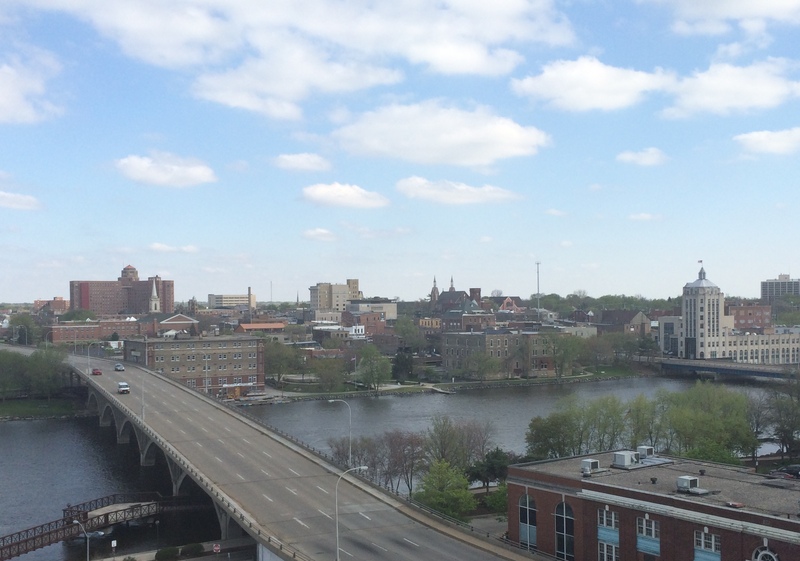 Rockford is also known as: The Forest City and Winnebago County / Rockford city. Zip codes in the city: 61101, 61102, 61103, 61104, 61105, 61106, 61107, 61108, 61109, 61110, 61112, 61114, 61125, 61126. Some of the notable people born here have been: John Blake (american football player and coach), Larry Morrissey (lawyer and politician), Steve Cherundolo (football player), Mike Gandy (american football player), Joe Mantello (actor and theatre director), , Debra Bowen (lawyer and politician), and Jodi Benson (singer and actor). Rockford is home to the following sports teams: Rockford IceHogs. Rockford is the third largest city in the U.S. state of Illinois, the 164th most populous city in the United States, and the 148th most populous region in the United States. It is the county seat of Winnebago County and is located on both banks of the Rock River in far northern Illinois. According to 2010 census data, the City of Rockford had a population of 152,871, with an outlying metropolitan area population of 348,360, which was estimated to have decreased to 150,251 and 344,623, respectively, by July 2013.Settled between 1834 and 1835, Rockford was strategically positioned between Chicago and Galena and thus became suitable for industrial development. Rockford was notable for its output of heavy machinery and tools; by the twentieth century, it was the second leading center of furniture manufacturing in the nation. Its decline, emblematic of other cities in the Rust Belt, led to economic diversification into automotive, aerospace, and healthcare industries, as well as the undertaking of various tourism and downtown revitalization efforts.Referred to as the Forest City, Rockford is known for various venues of cultural or historical significance, including Anderson Japanese Gardens, Klehm Arboretum, Tinker Swiss Cottage, the BMO Harris Bank Center, the Coronado Theatre, the Laurent House, and the Burpee Museum of Natural History. Moreover, its contributions to music are noted in the Mendelssohn Club, the oldest music club in the nation, and performers such as Phantom Regiment and Cheap Trick. It was written by Des Moines Register on March 26th, 2019 that Mary Elizabeth Davis (Baudhuin) perished in Altoona, Iowa. Ms. Davis was 58 years old and was born in Rockford, IL. Send flowers to share your condolences and honor Mary Elizabeth's life. It was noted on March 24th, 2019 that Jerry L Clifton passed away in Rockford, Illinois. Clifton was 78 years old and was born in Osceola, IA. Send flowers to express your sorrow and honor Jerry L's life. It was disclosed on March 7th, 2019 that Terling) perished in Rockford, Illinois. Terling) was 93 years old. Send flowers to express your sympathy and honor 's life. It was reported on February 20th, 2019 that Nancy Lucille Hrad (Lamerdin) passed away in Rockford, Illinois. Ms. Hrad was 82 years old. Send flowers to share your condolences and honor Nancy Lucille's life. It was revealed by Napa Valley Register on February 15th, 2019 that Sandra Ann Jensen passed away in Napa, California. Jensen was 81 years old and was born in Rockford, IL. Send flowers to express your sorrow and honor Sandra Ann's life. It was disclosed on February 11th, 2019 that Gary J Divine died in Rockford, Illinois. Divine was 66 years old. Send flowers to express your sympathy and honor Gary J's life. It was revealed by Chicago Tribune on February 8th, 2019 that Eric Paul Selin perished in Rockford, Illinois. Selin was 95 years old and was born in Orebro, . Send flowers to share your condolences and honor Eric Paul's life. It was revealed on February 7th, 2019 that James E Shields passed away in Rockford, Illinois. Shields was 85 years old and was born in Cross Co, AR. Send flowers to express your sympathy and honor James E's life. It was disclosed on February 5th, 2019 that Dorothy M Wheeler (Clark) died in Rockford, Illinois. Ms. Wheeler was 91 years old. Send flowers to express your sympathy and honor Dorothy M's life. It was reported by The Daily Herald on February 3rd, 2019 that Jerry Dalhauser died in Rockford, Illinois. Dalhauser was 76 years old. Send flowers to express your sympathy and honor Jerry's life. Whether you are sending funeral flowers or researching green funerals, iMortuary can assist you in your research regarding Rockford's funeral providers. Browse our site to locate funeral services such as: Rockford cemeteries, funeral homes, cremation providers, and funeral flowers. Rockford is nicknamed "The Forest City." Elm trees used to line many of the parks and boulevards. Some of the older neighborhoods still feature parks which encompass an entire city block or more. While many of the city's elms were struck down with Dutch Elm Disease in the 1950's, a variety of other kinds of trees have continued to thrive. Listing all funeral homes in Rockford, Illinois so you can easily send flowers to any location (same day delivery) or find any funeral service. Sundberg Funeral Home services the Rockford, IL community with all of their funeral home and funeral planning needs. Call 815-977-8940. Funerals in Rockford, IL on Yahoo! Local Get Ratings & Reviews on Funerals with Photos, Maps, Driving Directions and more.